Happy Thursday Y'all! Today I'll be finalizing my new blog design, revelling in my newly cleaned house (at least for the couple of hours minutes it will stay this way), and possibly looking for a new swimsuit. I'll let you know how that last one turns out. I've got one of my Texas blog friends here today talking about her new consignment project....I just love this idea and I know you will too!!!! Hey y'all! 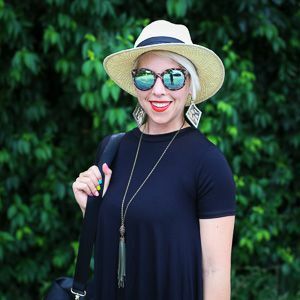 I'm Taylor and I blog over at Pink Heels Pink Truck. First off…HUGE thanks to my friend, Kristen, for allowing me to share one of my latest projects! I'm excited to be sharing with you all today a brand new dream that I've turned into reality (finally!!) Without further adieu...Meet Fabuless Wardrobe!! An online consignment shoppe. But not any online consignment shoppe. This consignment shop concept is different than most. :) At Fabuless Wardrobe, you purchase an ad spot for $1.00 per item. Each item is listed for 30 days for that $1.00. If your item sells, you will be forwarded the money (via paypal) without any additional fees (well, less paypal's original fees). The only fee you will incur is the upfront ad spot purchase! All items ship for free, so you build your shipping into your listing price. :) This site is basically a place to list your gently used items (even maternity! ), no more than 2 years old (preferably..it'll only help you sell!). You might even have stuff you've never worn before or even still has tags on it. So why not put it up for sale and see if you can add some cash to your pocket! :) There are a few items already for sale in the shoppe, so you must head over and check it out. And if you are ready to get to listing your own items, click on the Sell Tab to get started!! You'll tell me how many items you want to list initially, and I'll send over an invoice and then the link to where you can start uploading your stuff! I have my very own re-sale shop running through facebook (Ky's Closet). So, you may be hearing from me on your site soon!